Paul Cezanne once said “It’s so fine and yet so terrible to stand in front of a blank canvas”. 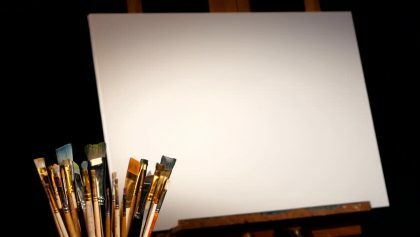 This statement resonates with any artist who has ever stood in front of a blank canvas, a pristine piece of paper, the blinking cursor on an empty computer screen, or an uncut block of wood or marble and felt the vertiginous mix of pressure and possibility that they afford to us. As AUUF moves forward on its journey, we have been given the gift of some fresh perspectives from Reverend Pamela Gehrke. One of those has been that we should consider our annual support drive in slightly different terms than we have in the past. The Oxford dictionary defines the word canvass as “to solicit votes from electors or members, try to obtain support, question someone to try to ascertain their opinion, propose an idea or plan for discussion, or discuss thoroughly”. While this word is certainly accurate for what we do every year as we seek to find among us the financial resources and clever ideas to keep the fellowship operating, it does carry with it the burden of that first and most commonly used definition, that of soliciting something. Inherent in that is the somewhat problematic implication that the people canvassing you are somehow different than the average member of our congregation, that they (and by extension the members of the Board and the Finance committee) are part of an elite group of people who are somehow more organized, more dedicated, and more in charge than you…and that they need your money to fund their budget. While the efforts of these people are significant and essential, as members of this fellowship they are no more important, influential, or empowered to determine its destiny than any one of you. Rev. Gehrke has proposed the alternate term “Stewardship”, used by other UU communities to name this annual commitment to our spiritual community. Although it’s always hard to change things that have become entrenched, I’ve come to like this term because it seems to carry with it an egalitarian spirit, and the more accurate notion that this place is not any more or less than the aggregated efforts of each and every individual who contributes to and cares for it. I want to say that again, and I want it to really sink in: This place is not any more or less than the aggregated efforts of each and every individual who contributes to and cares for it. This year, instead of coming up with a fixed goal and then attempting to fill spreadsheet boxes with dollars and cents, we want to take a fresh approach and ask each of you to think about what this place is to you, what it could be, and how much you are willing to give in money, time and effort to get there. In other words, if you’ll pardon the pun, a blank canvass. Imagine starting from scratch: what are the things that make AUUF a unique and valuable place to you, and to the Auburn area? What does your fellowship look like in its most basic, its “reach”, and its “dream” versions? In the last few months, our sanctuary has really lived up to its name as it has served as a meeting place for various grassroots groups fighting the rising tide of injustice, bigotry, and hateful rhetoric ushered in by the November election. Many of us, myself included, are feeling overwhelmed by a battle being fought on so many fronts. We have filled our calendars with meetings and marches, we have filled our minds with arguments and attempts at understanding, and we have sent out many checks and Paypal donations when we didn’t know what else to do. The next few years are going to be difficult for us, politically and by extension personally. Yet despite what I know will be a struggle like we haven’t seen in a long time, I also know that this place, this liberal religious community, will be crucial in that struggle. We will welcome new members, people like me who thought they would never (or never again) step foot in a church; what face do we want to show them, both spiritually with our traditions and physically with our facility? We will welcome people who feel that their current religious community no longer serves their needs or has betrayed its core principles; what things do we want to have in place to ensure that their strengths and experiences are folded into this place? We will welcome groups of people who need no spiritual home, but rather only a building in which to meet but who bring with them passions and convictions that inspire us and words that heal us and help us keep our sanity at least somewhat intact. And as always, we will need to care for each other with shared experience, insightful conversations, support for common causes, compassion, patience, coffee, food, music, flowers, art, and more. I challenge you all, in whatever way you can, to commit to this place with renewed vigor; for those of us in a position to give financially, to dig deep in our pockets; for those with more time on their hands, to pick up the load of organizational duties; for those with fresh ideas to bring them into the light. Together, we are the AUUF.